09 Nov Newborn Safety Week! I’m thrilled to have been asked by the NAPCP to contribute to their blog for Newborn Safety Week (November 7th – 11th). I truly hope that contributions such as this one will inspire photographers near and far, inexperienced and experienced alike to give a little extra thought to their newborn subjects and begin or continue to photograph with safety first and foremost in their minds. Newborn safety has been a much talked about topic within the industry as of late. With the recent explosion of new photographers and the mounting popularity of newborn portraiture, it’s now quite common to visit popular photo sharing and social media sites and encounter questionable setups or prop choices for little ones. Partly, some photographers and parents alike simply are not aware of the dangers to the newborn and so, if you are a photographer, aspiring photographer, a hobbyist or just really interested in babies, I urge you to head over to the Learn Shoot Inspire Blog to read the article on Newborn Safety. I’ve included many tips and thoughts on keeping your tiny subjects safe during your photoshoots. It’s not a bad read for expecting parents or those with new babies either. 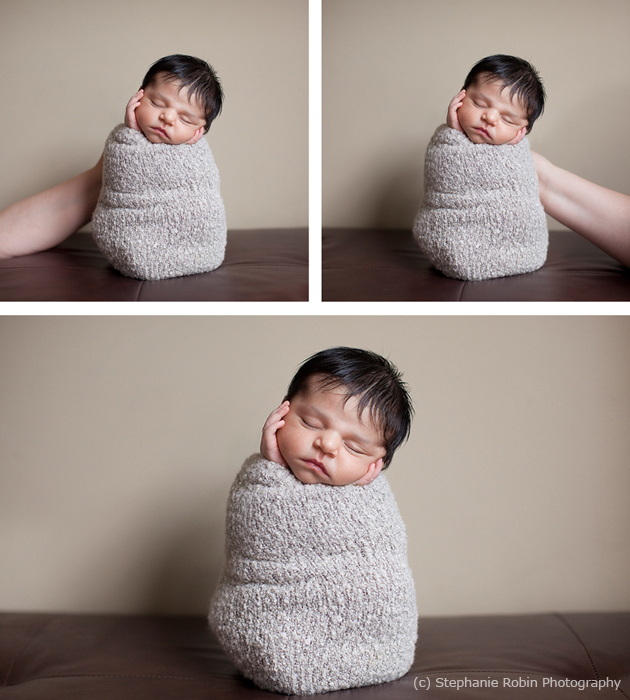 It’s just as important that you know what to expect and allow at your newborn’s first session! I’d also like to share the idea of composite images right here on the NAPCP Blog. A composite is in fact the merging of two or more images to create one seemingly impossible setup. Occasionally, parents will arrive to their session with a request for a special setup they have seen in which baby is balancing precariously or suspended from some type of apparatus. As a stickler for safety, I take any and every opportunity to keep babies safe during their sessions. Enter the composite image. Composites are a great way to ensure newborn clients stay safe regardless of how the final image appears and that hands remain on baby at all times in poses that may compromise their safety or lead to a fall. Revealing these techniques is a bit like revealing how the magician saws his assistant in half. But unlike magic, photographers out there ARE trying to pose newborns using unsafe methodology without investing in learning the proper techniques for doing so. Can you imagine sawing your neighbor in half because you saw David Copperfield do it on TV? Unfortunately, that’s where our industry has been heading lately. I’d rather reveal a few tips and tricks than see a baby injured at the hands of a photographer. Even one injured baby just isn’t worth it in my books. I challenge ALL photographers to consider ways in which they can deliver amazing imagery while keeping babies safety a top priority. It just DOESN’T MAKE SENSE to subject a baby to potential dangers for a picture. Ever. Newborn Safety Week is all about exposure and I look forward to viewing everyone’s contributions right here on the NAPCP site and forum, on other online forums and social media sites such as Facebook and Twitter! For more on choosing the right photographer for your sweet precious new life, please also feel free to head on over to the NAPCP Blog posting here! Great blog post Stephanie! I have shared your article via my blog, Twitter and Facebook Groups to check it out. It’s so darn important people understand what’s so important! Wonderfully written and timely article. Many Thanks for posting this. I really love your post. Newborn photographers and parents must consider these safety points during the photographic session. Thanks for the informative post.